Serves 2 as a vegetarian main course If the beans are young enough to use whole, string them and chop into small lengths. 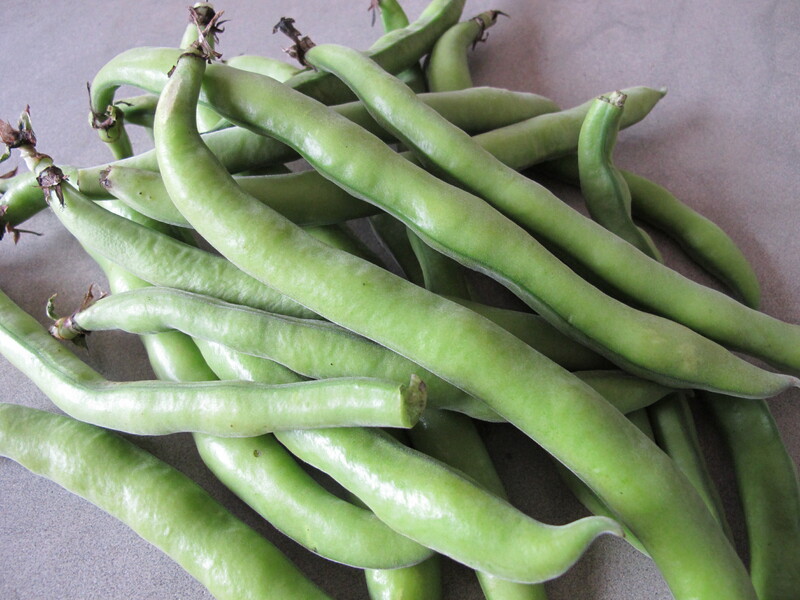 Otherwise, pod them. If using large artichokes, cut off the stalks, peel off the tough outer leaves right down to the base, leaving the tender inner leaves, and cut the artichoke into quarters. Nick out the exposed feathery ‘choke’ with a knife. If using small artichokes, wash and trim. If preparing artichokes ahead of time, put them in a bowl of water with the juice of half a lemon. Warm 4 tbsp of the olive oil in a large frying pan on a low heat, add the onion and garlic and let it sweat until softened and starting to colour. Add the tomatoes, turn up the heat, reduce it to a thick sauce. 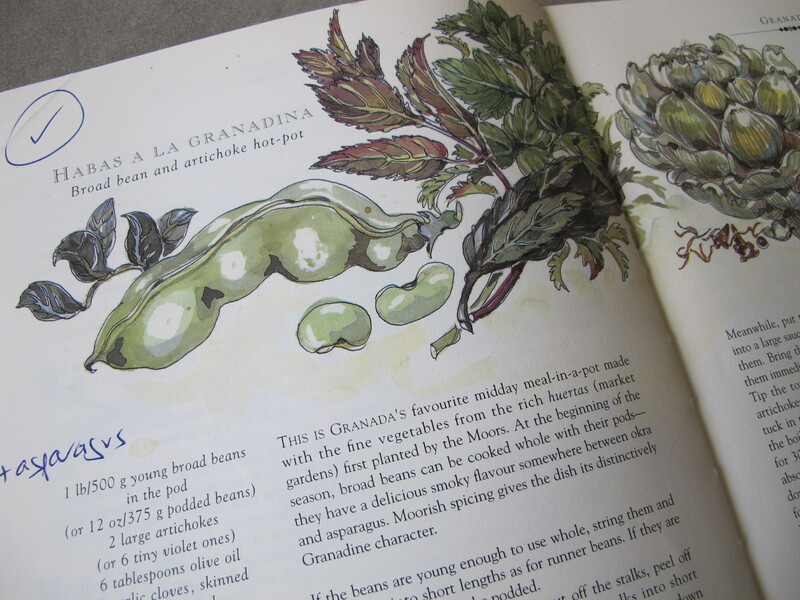 Put the prepared beans, artichokes and chopped asparagus into a large saucepan, covered with cold water. Bring them to the boil then drain. Tip the tomato sauce into this pan with the vegetables. Add enough water to submerge the vegetables, tuck in the bunch of herbs, season. Bring to the boil, cover and simmer over a low heat for 30-40 minutes until the juice is reduced by half. Heat the remaining oil in a frying pan and stir in the breadcrumbs. When they are golden, sprinkle in the saffron, cumin and paprika. Remove the pan from the heat, and mash the spicy breadcrumb mixture together. 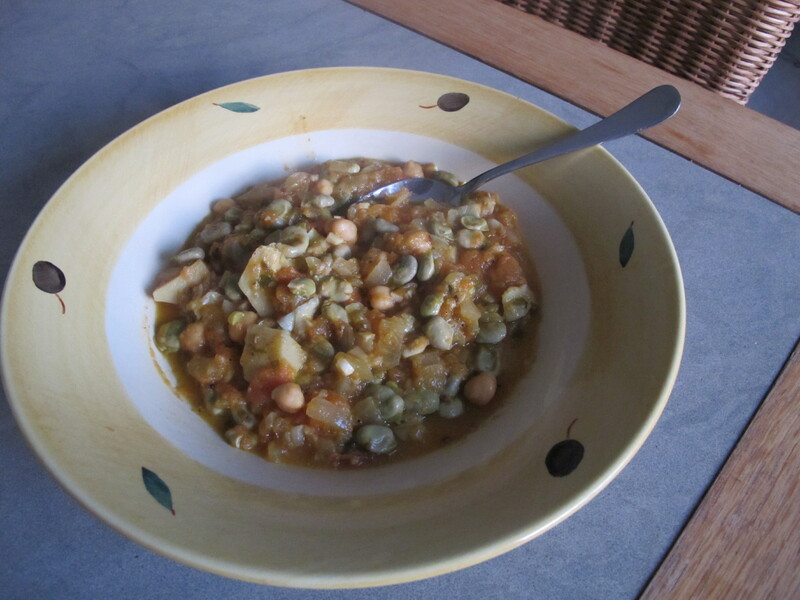 Stir this into the pan with the vegetables, add the chick peas and simmer for another 5-10 minutes. Just before serving, make dents in the surface of the stew with the back of a ladle and break in one egg per person. Cover, and simmer for 5 minutes until the eggs are lightly set. Alternatively, poach the eggs in a separate pan, and add to the plate when serving. 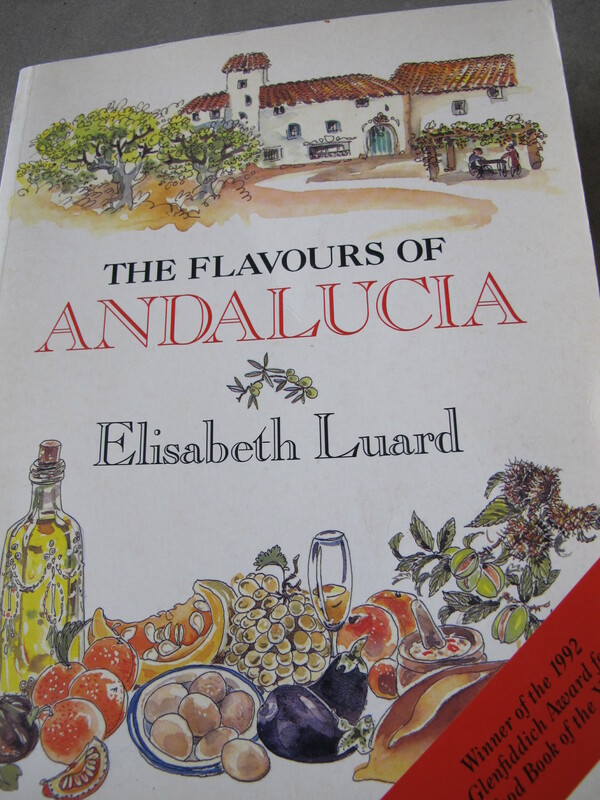 This entry was posted in A love of food and tagged Andalucia, food, recipes, Sandra Danby, Spain, spanish finca, Spanish food on May 18, 2013 by sandradan1. Wonder how this would turn out if I were to attempt this.